The 45.245km standard gauge rail line, which connects Nnamdi Azikiwe International Airport to the Abuja metro station, is the first of its kind in West Africa. “It is unfortunate that after three years in office, the President cannot boast of any development project conceptualized and executed by its administration in any part of the country,” the party’s spokesman Kola Ologbodiyan said in a statement on Thursday. The project was flagged-off by former President Olusegun Obasanjo in 2007 in an attempt to host the 2014 Commonwealth Games. Successive governments, however, failed to complete the project. 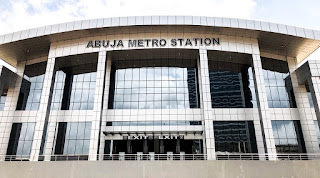 Transportation Secretary of the Federal Capital Territory (FCT), Kayode Opeifa disclosed that the project was financed through counterpart-funding with the China Export-Import (Exim) Bank on the basis of 60 per cent from the Chinese and 40 per cent from the FCT administration.